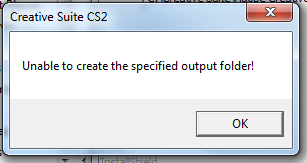 Run CreativeSuiteCS2Disc1.exe and let it extract the files to C:\Creative Suite CS2, but when the white ‘Welcome’ window appears, click ‘Cancel’ then ‘Quit’. Andy: Thanks for your comments - I wrote the instructions from memory after some trial and error getting it to work and I made a few mistakes. I've uninstalled and done it again from scratch - the instructions above should now work for you - sorry for the inconvenience! Alex: Thanks, it worked a charm! Mj: Did exactly as written. Still got insert cd 2 to continue to install. Now what? Sure would appreciate any help. Kay: Using this method the install went perfectly but I'm still getting an obnoxious freeze on the splash-screen after 'initializing' that makes Photoshop CS2 unusable. Do you have any idea what this could possibly be? Thanks so much! jeremy: The picture of the folder in step 3 appears to also include all the files and folders that you will get once you have extracted Disk1. So if yours doesn't have nearly all that content, it should once you extract disc 1. Jake: This guide works perfectly! Thank you so much! Joe: Well it worked great, not asking for CD2 anymore, but now its asking for CD3!! Lol this is almost not even worth the trouble! Any suggestions on what to do now? I have all the files moved just like in your illustrations and still get this error message. jake: It seems like step 3 needs a little clarification, as I think I did what you said, but am still getting the insert cd 2 error. Also, where should I extract disc one? If I let it go to default that's here- C:\Creative Suite CS2\ the folder you said I could delete after I moved the folders in step 3. I have working PS now, but I would really like Illustrator. hoojacks: Thanks for the tutorial, but it still does not work. Perhaps some clarity is needed. In step 3, you say "You must now move both folders from C:\Creative Suite CS2\ to C:\Creative Suite\Adobe Creative Suite 2.0\ – you can then delete C:\Creative Suite CS2" There is only one folder and some files in Creative Suite CS2. 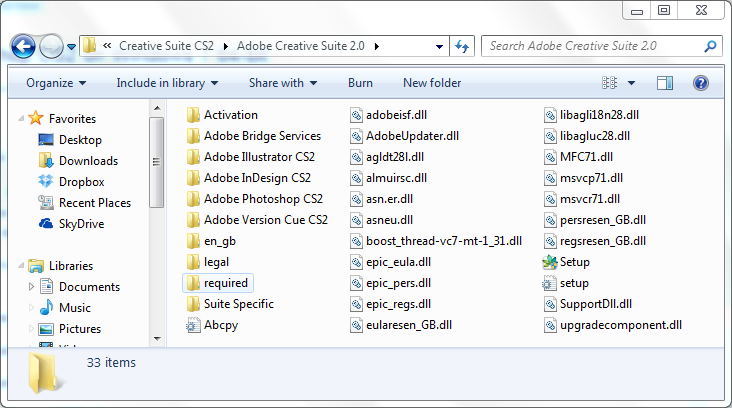 Or did you mean both the Creative Suite CS2 and the Extras folder? I moved all the contents of Creative Suite CS2 into the specified folder AND the contents of the extras folder in there as well, and it is still asking me for Disc 2. In step 5, should we extract the file into the c:\PROGRA~2\Adobe folder as well, or just the folder it prompts? I imagine this doesn't make a difference, but it's worth a shot? Thanks again! Samuel: Thank you very very much! Your guide worked perfectly for me on Windows XP 32 Bit. You helped me very much. I really appreciate this! Big thanks!! Baxter Tocher: Thanks for this, Andy - it's much appreciated. Any idea what we need to do if there's not enough space on C:? My C: drive is a fairly small SSD, but I have a fair amount of space on D:. Andy: Hi Sean, glad it's working for you! The vcs2.zip file contains a video tutorial for the cs2 suite. Just unzip it and run vcs2.exe The extras directory which expands to c: by default contains documentation, sample images and plugins which you can install manually. I hope this helps! marc: I just followed your instructions exactly on windows 7 64 and it worked perfectly! I'm stoked! Thanks so so much. Paul B: Very helpful. Thanks for posting. Mike: Many thanks for this! I had a similar problem to Joe in that it asked for disk 3 but then found it had still installed the main Photoshop app and I was able to manually create a desktop shortcut and open successfully. Should also note I installed to D drive as I have a small SSD C Drive like Baxter. Then I noticed that Step 3 doesn't mention moving the folders/files from "Extras" to the installation folder and that is why disk 3 wasn't found - I should have checked your screencap ;) All it seems to mean is that Illustrator wasn't installed so no problem! Thanks again. Sean: Thanks Andy. Everything worked properly. I had to do a double take on the instructions at step 3 but once I got that straight, it installed just fine. I have a couple questions though: 1) What do you do with the VCS2.zip file? 2) Did the installer do anything with the extras folder? It didn't get moved into the main folder with the rest of the install files so did it get installed? marc: Actually, does anyone know if the Premier Pro free download from Adobe works with windows 7? Is it the same idea, to update the installation path and make sure everything else lines up? Or will it work just fine, or not at all? Thanks! Elaine: Thank you, Thank you. Thank you. Wish I had found this thread 8 hours ago! BUT..Find it I did...finally. Thank you, again! Nick: Thank you sooo much for posting this! Svend: Hi. I installed PS CS2 on win 8 64-bit. The install worked fine (using the Progra~2 fix), but after a short while PS becomes unstable and eventually crashes. Any ideas what is going wrong(other than the fact that cs2 is written to a 32-bit system). Philip Knight: Andy, I'll get to downloading and installing the whole CS2 but all I really need for now is Illustrator, and even that far simpler install is not working; so I'm guessing the same will happen with the whole enchilada. So need to solve this issue first: -- I have looked up and used the Program~2 alternative to Program Files (x86), but the installer hangs at the exact same place on the progress bar as it did when using the latter location -- about 60% in. I have to nuke it through the Task Manager--where there are 4 Installers happening for this. I run the installer as Administrator too. That seems strange: I can understand 2, installers -- one for the 32-bit program itself and maybe another for the 64-bit OS to convert or accept a 32-bit. That said, Firefox shows two Adobe Flash plugins running when fired up. So maybe irrelevant. Whatever the case, what am I doing wrong? Thanks. _____________ PS: The reason I'm primarily interested in Illustrator at this point is because I have Illustrator 8 (yeah, really old -- ca. 1997) and I think it's a 16-bit program so it won't install on Win7. It worked on XP. Philip Knight: PS: I think I know why this install (or any other of CS2 or its parts WON'T work for me: I don't have a purchased version of CS2 and I don't do crack or pirated software. I thought the serial number provided was equivalent to a purchased version. IF I'm mistaken and I can make this work without a purchased version, let me know. Please :) Thanks. Lilly: Thank you!!! No more gifts from Adobe for registering but this still works! Thanks! Tiziana: Thank you sooooooo MUCH!! I was almost hopeless, then I found this!! ^^ THANKS! Mary: Worked like a charm! Thank you! Thank you! I had CS2 on my old computer. I could not install it on my new laptop -- it would not give me an authentication code. When I called the Adobe help line I got a recorded message sending me to a dead link on Adobe. When I called Adobe and got a live person, they told me they no longer supported CS2 and I was simply out of luck (in other words, gee, why don't you buy the newest version?) You really saved the day for me. God bless you! Janet:* Hi. I've followed your instructions to the letter but when I try to run "setup" as per step 5 I get the following error message: Missing or Invalid Personalization Information Missing resources library Any ideas? This is driving me insane!! Collette: Thank you that was great! One comment (which might have been addressed already) where you say "You must now move both folders from..." it might be clearer if you said "you must now move the two folders from..." But otherwise clear, comprehensive and it worked!! Don A: The very least that I can do is to say "Thank you." I worked perfectly as far as I can tell. There were so many other links that were leading me astray. Thanks again. Debbie: Thank you! I just spent ages typing this exact thing out on someone else's question on the Adobe forums, only missing out how to find the accurate DOS code. Progra~2 generally works for Win7 64 bit. Thanks!! Dave: This worked perfectly on a 64 bit Windows 10 install. Susan: THANK YOU, THANK YOU, THANK YOU!! I just got a new computer and have the old CS2 CDs but the serial number no longer worked. Went to Adobe "chat" and was given a link with serial numbers and programs. Spent hours trying different ways to get CS2 on my computer. At my wits end, I googled and found you. Thank you so much for taking the time to clearly explain how to make it happen because I kept getting hung up on "Insert Disk 2". Out of desperation, I even tried inserting the old CD 2 I have but that didn't work!! I'm not overly techy. :) I can't believe your directions worked. God Bless you for not keeping this fix to yourself. lezav: The latest version of win7 sp1 now allows 'program files (x86)' as folder name in CMD (as opposed to porgam~2).... and since adobe does not allow parenthesis in folder names, what to do now to install cs2? Steve M: Hi......followed all the instructions but getting install CD2.....??? Rob: Thanks so much. Your instructions were invaluable. The installation worked perfectly. You are a savior. Steve: Hi, I'm having the same trouble as Janet had (comment 23). I followed the direction word for word but must have missed something? Cici: These instructions helped a lot. One issue I'm still experiencing is that I can't get InDesign to work. When I open it, it prompts me to enter the serial number. Once I do, the program shuts. I tried uninstalling and reinstalling just InDesign twice, and I get the same problem every time. I don't have this problem with the other programs; some of them prompted for the serial number, but once I entered it, the program opened and functioned. Any ideas of why it's doing this or how to resolve the issue? Thanks. Dorothy Card: I would hug you if you were here. We struggled for 3 days before we found your instructions. Read them over and over until I understood each step and then went for it. It worked like a charm. Installed on new Dell Optiplex 5040, Win 7 Pro 64 bit. We had purchased Adobe Creative Suite CS2. Yes I know it's old but it works for us for now. Old Dell died. Saved us big $$$$. Thank you for sharing! alchemistj: Your Baller! Have saved me doing this a 2nd time now! Thanks!